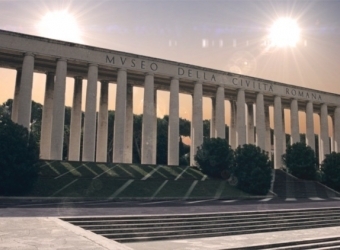 Sean Kelly announces its new exhibition, Grasso, Grimonprez, Koh: Three Installations, featuring three distinct interventions by Laurent Grasso, Johan Grimonprez and Terence Koh. Whilst seemingly disparate initially, all of the works are united by the themes of duality, hidden meaning, and cinematic influence. 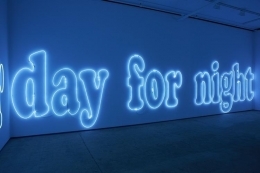 Laurent Grasso’s large-scale neon installation, Infinite Light, is comprised of ten-foot high letters that repeat the phrase “day for night.” The neon color matches a shade of blue filters used in film to simulate nighttime when scenes are shot during the day, an effect called la nuit américaine in French. 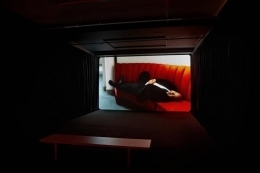 This cinematic technique creates a false or ambiguous reality, a common theme in Grasso’s oeuvre. 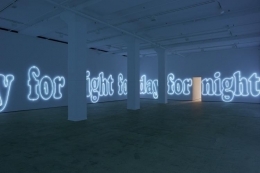 The term “day for night” is also a reference to Francois Truffaut’s film of the same name. 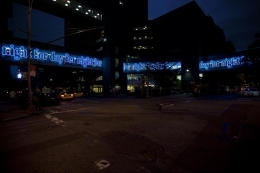 Infinite Light was realized in coordination with the MoMA’s exhibition Van Gogh at Night, curated by Joachim Pissarro, and installed across the Lexington Avenue pedestrian bridge at Hunter College in New York in 2008. Johan Grimonprez’s Looking for Alfred (2005) explores the idea of doubles and false identities by way of Ron Burrage, the renown professional Alfred Hitchcock look-alike. 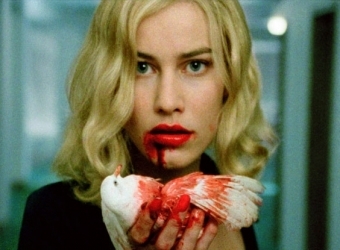 The film is a surrealist combination of Hitchcock’s trademark cameos, in this case by doppelgängers of the famous director, as well as Grimonprez’s first reference to Hitchock’s The Birds and the actress Tippi Hedren, all critical narrative devices in his subsequent full-length feature Double Take. This will be the North American premiere of Looking for Alfred. 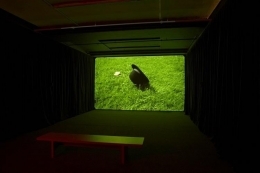 Terence Koh’s one person at a time was previously presented as part of an impromptu short-term installation on the occasion of the closure of the artist’s studio in the fall of 2012. 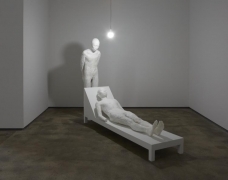 Two cast wax figures of Koh, one standing and the other reclining on a chaise lounge, are positioned in the room as a dual self-portrait and a reference to the classic Freudian notion of the examined self. 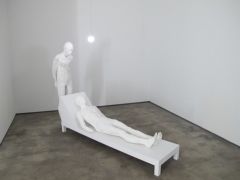 The ghostly white figures are Koh’s elegy to the creative process that took place at the studio, and a reflection on loss and longing. Laurent Grasso lives and works in Paris and New York. 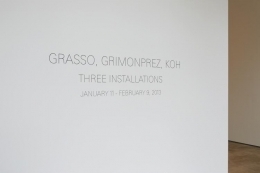 Grasso’s work has been exhibited extensively worldwide, notably in solo exhibitions at the Hirshhorn Museum and Sculpture Garden, Washington DC; the Kunstverein Arnsberg, Germany; the Centre Georges Pompidou, Paris, France; the Palais de Tokyo, Paris, France; the Saint Louis Art Museum, Missouri, the Samsung Museum of Art, Seoul, Korea; and the Musée du Jeu de Paume, Paris, France. Grasso’s work has also been included in many international biennales including Manifesta 8, Cartagena / Murcia, Spain; Sharjah, United Arab Emirates; Gwangju, South Korea; Moscow, Russia; and Busan, Korea. A major solo exhibition, Uraniborg, will open at the Musée d’art contemporain de Montréal on February 7, 2013. Grasso was awarded the prestigious Marcel Duchamp Prize in 2008 and is the subject of a major monograph— Laurent Grasso: The Black-Body Radiation—published by les presses du réel. Johan Grimonprez lives and works in Brussels and New York. Grimonprez’s work is included in numerous collections such as the Centre Georges Pompidou, Paris, France, the Kanazawa Art Museum, Japan, the National Gallery, Berlin, Germany, the Louisiana Museum of Modern Art, Denmark, and ARTIST ROOMS, Tate, United Kingdom. 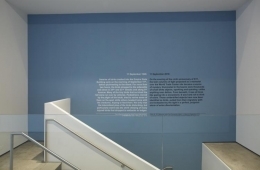 Exhibitions have been presented at major museums worldwide such as the Whitney Museum of American Art in New York, the San Francisco Museum of Modern Art, the Pinakothek der Moderne in Munich, Germany and the Tate Modern in London, England. 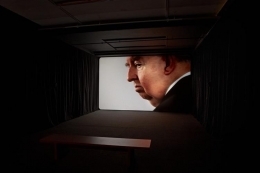 Grimonprez achieved international acclaim with his film essay dial H-I-S-T-O-R-Y at Documenta X in Kassel, Germany, in 1997, which, in retrospect, eerily foreshadowed the tragic events of September 11th in New York. His full-length feature, Double Take (2009), received the Black Pearl Award at the Abu Dhabi film festival, a Spirit Award, and was an official selection of both the Berlin and Sundance Film Festivals. His current film project The Shadow World: Inside the Global Arms Trade by author Andrew Feinstein, was awarded a production grant from the Sundance Institute. 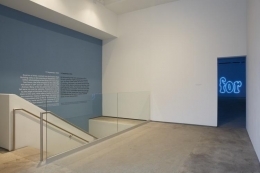 Grimonprez is currently a faculty member at the School of Visual Arts (New York). Terence Koh lives and work in New York. 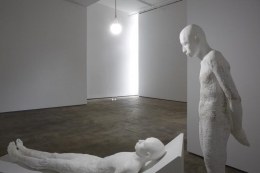 Koh’s work is in the permanent collections of such notable institutions as the Museum of Modern Art, New York; the Whitney Museum of American Art, New York and the Tate Modern, London. He was the subject of solo exhibitions at MUSAC, León (2008); Schirn Kunsthalle, Frankfurt (2008); the Whitney Museum of America Art, New York (2007); Kunsthalle Zürich (2006) and the Vienna Secession (2005) amongst others. 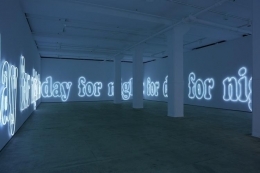 His work was included in the 2004 Whitney Biennial and the 2008 Yokohama Triennial. In 2008, he was a finalist for the Sobey Award. In 2014, Koh will be the subject of a major monograph being published by Rizzoli; also forthcoming is a solo exhibition at the Museum of Chinese in America, New York and his debut solo exhibition at Sean Kelly in the fall of 2013.